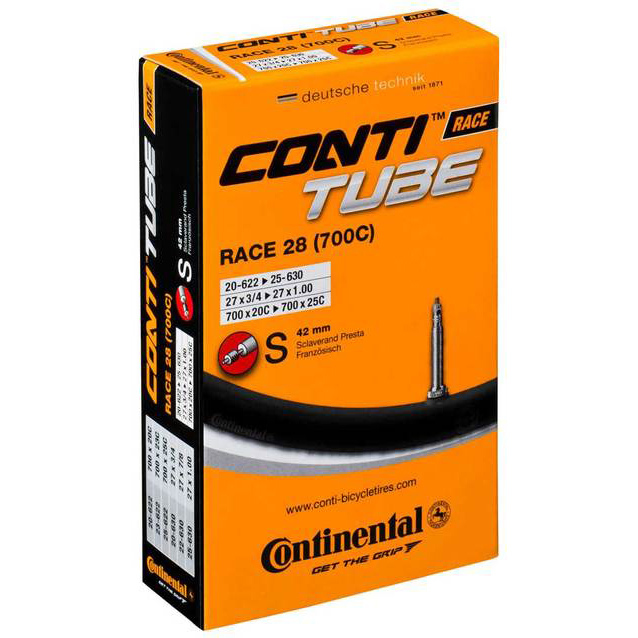 Continental Race inner tube with a choice of 42mm, 60mm and 80mm valve lengths to fit most rim types. Always had good luck with these tubes. Best price around. I always buy continental inner tubes as I feel they are a quality product. The best tubes on the market with a great value price. These are my go-to for everyday training. For the most part they've been good tubes. I did have 3 in a row fail where the valve meets the tube. Whether that was a fault in the product or my own wrong-doing (maybe over-tightening the valve nut?) I'm not sure but seemed a little odd that it happened to 3 in-a-row, whereas before would happen very rarely...and I've been cycling for many years now. I just decided not even to bother with the valve nuts anymore. Price is unbeatable, quality is fantastic. Very long lasting and reliable tube. Great inner tube for the money, delivered promptly as always by Merlin, my go to online store for bike stuff. Excellent value for money and are reliable and easy to carry in a bag. Perfect for a spare inner tube given its price. I purchased these tubes with 80mm stems. These are the only tubes I buy for my 60mm rims. No need fussing with an extender. Rolled-up they are significantly more compact than a regular tube so they fit easier in your back pocket - and they're lighter too. Superstition it may be, but along with Kenda, I consider these cheap Continental's my lucky tubes. Seems like everytime I use another brand I get punctures quick. Great price and great tubes! Good, solid tubes. Not the lightest but great value for money. Both my son and wife use these tubes in their bikes as do many of my friends. Good price for Conti tubes. I've been riding Conti tubes for two seasons and the quality of rubber & weight is pretty good compared to Michelin. Use this regularly and they do the job at sensible price. Continentals are the best. Reasonably priced, especially for the weight. Continental tyres and tubes are the ones I learned to use over the decade of intensive cycling. Highly recommended! I like using tubes that have replaceable valve cores, so these are ideal. Been using these tubes for all of my Pinarello bicycles. They aren`t the lightest but are easy to install and are somewhat resistant to small punctures. The valves are threaded which can be an issue for some people. I wrap a layer of electrical tape around the threads when installing them on my Carbon clinchers to prevent rattling. Always found these tubes to be reliable, and reasonably light. The only tubes I ride on.. After thousands of miles; Never had a problem. Good value for money. Perfect for everyday riding but maybe a bit on the heavy side if you're trying to save grams on your race machine. Good product at a good price. It's tough to find the 80mm tubes for the deeper wheels, so nice to stock up. Good Inner tube, decent price, not lightweight but good for commuting. Go to quality tubes. Reliable Conti product. Haven`t had a flat for long time with these tubes, great and light. Great tubes, long valve tubes are expensive for me to buy locally (3x the price). Good for my 50mm rims - no need for valve extenders. Fast shipping, no duty delivery to Canada. I have had these before, they are a robust rubber a bit heavier than some others but more durable. Usual Conti quality, the most reliable long value tube you can buy. I had been using this tube for a while.. No complaint so far. Excellent road tubes at a bargain price, I always use these, generally very reliable. Bought two as spares. Haven't had to use one yet (knock on wood). Well packaged - neatly rolled with an elastic band around, so they will fit straight into your preferred means of carrying when on the bike. Good value for money. Used them for a few years now and they are just as good as some of the more expensive tubes. Arrived quickly & a good price. Would buy again. Still the best tube choice for me - quality rubber, valve and bullet proof valve/rubber interface. I have never had an issue with these tubes. Good resistance to puncture and improved comfort. Great quality lightweight tubes for my new carbon wheels. Better than average construction quality. Great product that suits the deep dish wheels. Good work Conti! These tubes seem nice and tough...better quality than the last ones purchased. Haven't had to use them yet and hope they are not needed soon but one never knows when you will....always be prepared and carry a spare. These tubes seem to be of high quality, and installed easily under my 28mm tyres. Basic tube that I give to friends when they expect a puncture repair FOC. Like to keep Race 28 light tubes & Conti Supersonic tubes for my own families bikes! Easy to use and pump up. First time using this product. Value for $. A bit thick but quite good for the price. This friend has been with me since three years ago, punctured almost 30 of them but totaling my mileage of 60, 000 kilometers in total so it is worth every penny. These are the only tubes I have been using now for the last few years and have had no issues. Match with Conti GP 4000 II and no flats over 3000 miles. Awesome product awesome price, have been using them on my roadie for years. Reliable inner tubes. High quality and perfect for all around riders. The benchmark in bike tubes. You can't go wrong with these ... especially when combined with Continental tyres such as Grand Prix All Seasons. Very nice inner tube. Bought them because they're highly recommended by all my riding buddies. Classic. Dependable tubes. Why buy anything else? Continental makes great products. I hace yet to have a seam or valve fail with their tubes. Sure, you can find cheaper tubes, but definitely not worth the savings if you have to repair unnecessary flats. Have only had these about a week now but they seem like they'll hold up well! + light, great 80mm valve, reliable. - expensive, never use with tube-less tire. Been looking for long-valve tubes for ages - much less faff than valve extenders and so on, recommended. Plenty of room in 50mm deep wheels. 100 miles in with no punctures and no loss of air, usual Continental quality. Great product these tubes have lasted me forever in the past I'm sure this one will also. Strong tube. I nearly pinched it getting it under a new tire and it held up. One of my favorite brands of tires. Have a locking nut on the valve stem to keep it locked into place which is great for preventing it from breaking away from the tube while inflating. Tubes are tubes, but I feel better running some conti's... never flat with these. Having tried cheaper tubes and regretted it, these will be the only tubes I buy from now on. Great quality! Good quality and good value inner tube. I have had good success with these. Tubes are typical continental quality. No problems with them. Bought 3, 1st was defective but didn't find out until it rubbed flat 10 miles in. There were two 'dimples' in that tube. Other two have 500 miles on them with no issues. Nice long valves for use with deep rim carbon rims. Non-threaded shaft for a clean look. The tubes themselves seem pretty reliable. Good price from Merlin and fast delivery. Great tubes at a great price. Removable valves too. Great tube, keeps the pressure! Usual High Quality Tubes from Conti. I stick to proper brand name inner tubes, with the replaceable valve cores, cheap tubes are a false economy, and to be honest, at the price Merlin sell these for, there's no point in skimping. I have done around 400 km/week with these, and had no problems. Great service from Melin and fast delivery. For me the best tubes you can buy. Great price from Merlin. Not a bad weight for the price, not had any punctures with these yet. Simply superb inners. At Merlin prices grab a bagful. The best tubes you can buy.. Consistent top quality. These are solid tubes. I judge by how long the valves last, and these tubes don't deflate very much at all. I am a heavy rider (98kg) no problem with this tube and it is a kind of light tube. I bought 5. Very good inner tube. Fits both 23c and 25c. Excellent service from Merlin Cycles as usual. Just as advertised. A great, inexpensive training tube. I have been using these tubes for some time, very reliable. Price is excellent. To be honest I am not sure how to rate an inner tube. I have never had much trouble with any inner tube except for the occasional flat which you will get from any inner tube. I went with Continental this time for name recognition and I have no complaints. Good value tubes. I've been using them for years. Amazing material,great feeling on the road, I recommend these tubes. Seem to hold air a bit longer than non-branded tubes. These tubes look solid. I only have about 60 miles on them. All good so far. After riding on Michelin tires and tubes for the past fifteen years, I thought I would try Continental tires, so I added the Continental tubes as well. I am impressed with the quality on both tubes and tires; it is much better than what I have been experiencing with Michelin. Continue to be the best. I've tried many other brands and these last the longest plus, I've never experienced any manufacturing defects. This unlike some Michelin Airstops where three out of six failed for no apparent reason! Usual conti quality. Better valves than other brands. Conti are a brand you can trust, wouldn't buy anything else. Good reliable tube, as you would expect from Continental. You want to ride with confidence and these give you that. I've been using this tube for more than 1500km and got no punctures so far, even with a cheap tyre. I guess it can't get better than this. Have used these for past year since getting my new roadd bike. Not too many punctures except when running on worn tyres tyres last couple of weeks before I purchased new ones from Merlin. Had a couple of issues with slow punctures due to valves but may have been me using the track pump. Ovearll good buy and happy with them. Fitted with a pair of continental GP Force/Attack tyres, first choice after using Continental tubes on my Mtb, perfect quality. Pressured right up! Hasn't leaked over the last three days since installation. Fantastic tubes. Great durability. Percentage of punctures has decreased dramatically. Very fast delivery! These are very good, recommended! Great inner tube, holds pressure and good long valve choice. Good ol' Continental. What more can I say. Quality tubes you can rely on not to fail when first inflated. Good tubes, very rubbery! Longer valve-stems for those 'dishy rims' Well priced.